Vikas Gupta who had rightly carved a niche for himself as a creative and a producer, after coming in front of the camera has certainly and definitely left a very loving and a long lasting impact on the audience and his fans. 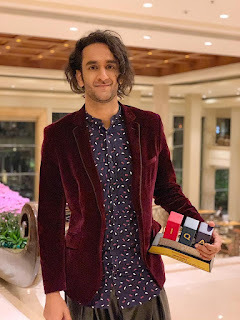 Vikas has been on a role with Bigg Boss, Ace Of Space, Punchbeat, Khatron Ke Khiladi and now Khatra Khatra Khatra; along with a TV series and web series coming up, he has his hands full. The dashing and talented Vikas won an award for being the - Impactful TV Personality of 2018. It wasn't just 2018, looks like he shall be leaving a much stronger impact in 2019 as well. Vikas exclaims, “I was deciding to take a break from my work on-screen and focus on my work behind the screen and that’s when I get this. Kareena Kapoor Khan was the Chief Guest for the evening and it was hosted by TV star Rithvik Dhanjani. Parth Samthaan, Sunil Grover, Harshita Gaur who came in to receive the award for Punchbeat & Mirzapur along with few others were also felicitated at the event.